Security forces launched a cordon and search operation in Khiram in Srigufwara area of the south Kashmir district on Friday morning after receiving specific intelligence input about the presence of militants. Srinagar: Two militants reportedly affiliated to the Islamic State Jammu and Kashmir (ISJK) and a policeman were killed on Friday while several civilians injured during an encounter between ultras and security forces in Anantnag district of Jammu and Kashmir, police said. 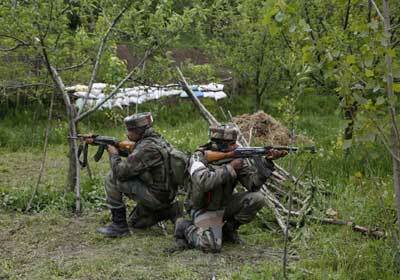 “Encounter at Khiram Srigufara on, two terrorists down, firing still continues. Unfortunate we lost one colleague of J&K Police,” Director General of Police (DGP) SP Vaid wrote on Twitter. In another tweet, the DGP said the militants were reportedly from the ISJK. “Terrorists reportedly affiliated to ISJK,” Vaid said. Security forces launched a cordon and search operation in Khiram in Srigufwara area of the south Kashmir district on Friday morning after receiving specific intelligence input about the presence of militants in the area, a police official said. He said the search operation turned into a gunfight after the militants fired upon the forces, who retaliated. The gunfight was going on when last reports came in, the official said. He said clashes broke out near the encounter site as a group of youth started pelting stones on the forces who are engaged in the operation. Security forces used force on the protestors and several civilians have suffered injuries, the official said. Further details were awaited.